Approach shoes are a combination of hiking shoes, climbing slippers, and occasionally mountaineering shoes. Approaches can vary from multi-day, multi-terrain environments so you want your shoes to be able to handle a variety of situations. 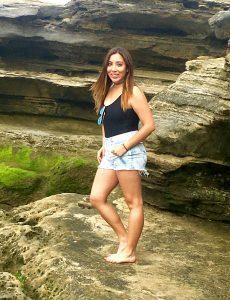 You want to make sure that aren’t exerting too much energy before the actual climb begins. Therefore, it is key to find an approach shoe that performs really well in both hiking and climbing situations. You’ll also want to think about the breathability and waterproofing of your approach shoes. Knowing your terrain is also an import factor to consider. Certain approach shoes may not be necessary in certain conditions. 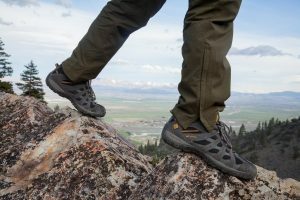 We took a look at some of the industry’s best approach shoes for hiking and here are our 5 Top Picks. 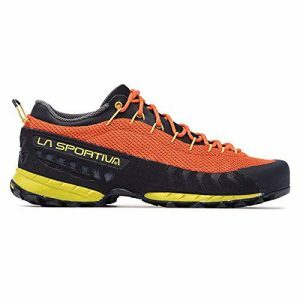 The La Sportiva TX3 is a great approach shoe that handles small holds really well. The sole has a smooth area of sticky rubber under the toes for smearing on rock. The wide base protrudes a bit to allow for solid edging. These shoes perform really well on hiking trails. They are equipped with round lugs of Vibram Megagrip sole that cling to both rock and snow. There is also an in-cut heel that helps with downhill braking on loose ground. The TX3 offers cushioning and support under large loads. There could be a bit more ankle support; however, the wide foot bed aids in creating a solid platform. These shoes offer great breathability due to the quick-drying, polyester mesh upper. It allows for quite a bit of airflow, even on hot summer days. This aids in preventing too much sweat build up. The sole of the TX3s provides very stable traction on snow. The sole protrudes from the upper and allows for secure side stepping. The beefy heel digs in well on the slope descent. The toe box is a bit of a strange fit when paired with crampons, but workable. The upper is almost entirely mesh, making these approach shoes quite bendy. This can cause them to be less stable under tension in the crampon. The upper is also quite permeable, so you will experience wet feet in soft snow. Due to the mesh uppers, the will also not hold water, so they don’t get heavier. They will also dry quicker after getting wet. They weigh 1lbs 4oz, which is a middle-of-the-road weight for an approach shoe. This makes them suitable for dangling on your harness on a climb, or shoving into your pack for longer ascents. The lacing system consists of metal and cord eyelets. Pulling the heel loop causes the lace eyelets to constrict, creating a secure toe box fit. The TX3x have excellent arch support and a stiff sole that provides stability in a variety of terrains. The outer lugs also add extra stability on uneven terrain. The Arc’teryx Acrux is designed to be stable, comfortable, light, and provide grip. They are minimalist by nature, but are a great choice for a day of climbing and hiking. The Vibram rubber sole provides great traction on all types of terrain. In addition, it features a smooth toe, shallow lugs over the midsole, and heel tread for traction and breaking. The upper provides a high degree of stability and protection from rocks. The liner also aids in keeping out dirt and debris. The Acrux has a low profile and relatively narrow toe box. It also features a patch of smooth rubber under the big toe, stiff edges, and a durable upper material. The adaptive liner creates a climbing slipper-like snugness for extra stability on technical rock. These approach shoes also smear really well, even on wet rock. They are very functional when it comes to edging, providing a blend of stiffness and sensitivity. The rand comes down to meet the sole, providing an integrated rubber zone for perching on edges. The liner is very sock-like, which is great for crack climbing. This allows for your foot to be secured into position when torqued in cracks. The narow toe box also fits into smaller cracks than most approch shoes. The Acrux is constructed with a slip-on, tongue-less liner, housed inside a seamless nylon upper. The upper liner is thermo-laminated and adds durability and water resistance, without increasing weight. The upper is also abrasion-resistant, so it will keep up on long miles and sharp terrain. This shoe is not fully waterproof. Moisture can enter through the exposed liner in between the laces. These aren’t the best options for trudging through inches of water, but it will still provide some water resistance. The Acrux is not the best choice for those with wide feet. They nylon upper can be uncomfortable to wear, and unyielding for larger feet. There is not much stretch or conformity in these shoes, so they will remain quite stiff. The Five Ten is a lightweight design with a high degree of stability, especially on rock. These approach shoes merge the rubber rand and sole into a streamlined beveled toe. This allows the shoe to perch on small edges with the precision of a climbing slipper. The stiff midsole transfers the power of the entire foot to where the toe meets the rock. It utilizes Stealth C4 rubber, giving them a sticky sole. These shoes provide great traction while bouldering, smearing, and edging. Because the high-performance rubber covers more area around the toe box, these shoes are also durable in cracks. The sole is thick and stiff, which makes this a less sensitive approach shoe. There is also extra cushioning around the ankle, giving a slightly bulky feel at times. However, there is room for break-in, allowing these shoes to become both comfortable and responsive over time. The Guide Tennie features a synthetic tongue and collar for extra breathability. These shoes aren’t necessarily the best at excelling on wet terrain such as slippery leaves or ice. The Guide Tennie is extremely durable due to the thick suede upper and burly sole. Because the rubber rand extends around the entire toe box, these shoes are protected from abrasion. This shoe also holds shape really well and stretches less when wet. The upper is mostly suede that provides high levels of water resistance. It isn’t fully waterproof, but is still able to achieve dry feet in wet snow. These shoes fit wide feet very well, so you may want to order down a size if you have small feet. You will also experience some stretching in the toe box. The flat laces are super secure and have a strong hold. The Guide Tennie is a great all-around approach shoe, but we think it definitely excels when it comes to climbing. However, it still offers comfort and support when hiking and carrying heavy loads. The gusseted tongue also aids in keeping sand and debris out of the shoe. 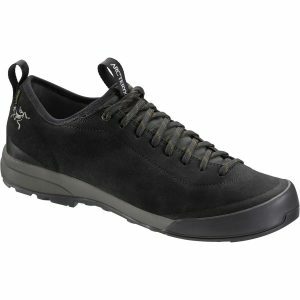 The Boulder X is a durable and supportive approach show that is great for rough scrambling. It comes with a Vibram Idro-Grip V-Smear sole that supports both climbing and hiking performance in dirt, sand, and mud. This shoe is extremely supportive and provides plenty of traction for hiking. The Boulder X is moderately stiff, but comfortably stands on medium sized edges. It doesn’t quite have the sensitivity for smaller edges. The lacing system can be cinched down for better edging, but it still remains limited on small edges. The toe shape is a bit rounded, which also makes it hard when edging in pockets. However, it makes up for it with maximum foot support on medium to large edges. This approach shoe can feel a bit clunky, but it still provides enough forefoot flexibility to offer high smearing performance. The rubber and tread patter on the Boulder X finds a nice balance between climbing performanc and traction on the trail. Despite being slightly on the bulky side, the Boulder X has a relatively low toe profile. This allows for some really great crack climbing. It is also stiff enough to transfer twist into the midfoot. 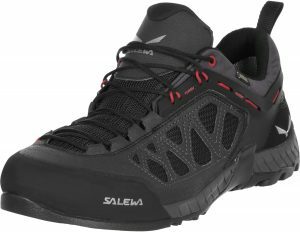 This shoe does provide comfort when hiking, but you may want to look into some lighter models for long distances and heavy loads. The leather tongue is not gusseted so if offers less breathability than other models. The Boulder X is most suited for climbing areas where you need to carry a heavy pack over rough terrain. It is a heavy and durable approach shoe that prioritizes foot support and good dirt traction. The trade-off is a bit of weight and climbing performance. The Firetail 3 is an very functional and durable approach shoe. It comes with a Vibram sole that adds extra security and support. This shoe is very rugged and can withstand the abuse of the trail. The sole of the Firetail 3 grips over rocky terrain extremely well. The inside and outside of the toe area are smooth for better edging performance. This shoe will also handle wet rocks like a champ. The toe box is larger and more rounded than many other approach shoes. This makes this shoe less ideal for desert environments with many cracks. However, the toe box provides exceptional comfort even when the lacing system is engaged. The functionality of this shoe is limited with torquing on the toe, scaling a crack, or making other precise moves off the toe box. However, the large toe box allows you to kick up sections of snow when approaching the base of an alpine climb. The lacing system is very similar to a climbing shoe. They extend from the top of the shoe, near the ankle, all the way to the toes. This allows for the ability to fine tune adjustments for a more comfortable fit. The Firetail 3 is offered in both a Gore-Tex and non-GTX version. The Gore-Tex liner will provided waterproofing capabilities. Keep in mind that even though GTX repels water, it tends to hold in moisture when completley saturated in water. Underwater traction will be superb, but you will feel soggy and bogged down. The non-GTX option is approx. $20 less and 10 grams lighter. For long days, you might want to acctually consider the quicker drying and lighter non-GTX shoe. The Firetail 3 feels agile and light, perfect for hanging on a harness or throwing in a pack. Due to the lacing system, these shoes run to true to size. Sizing up or down won’t be needed. There is plenty support for thoes with high arches. The underfoot cushioning also aids in eliminating foot fatigue. This approach shoe is a great all-arounder that can handle rough use, climbs, and hikes. 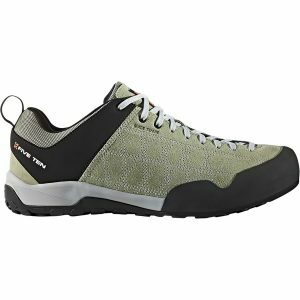 Approach shoes that excel on the trail generally have a larger profile, roomier fit, and added cushioning for long days on your feet. They’re supportive and protective under heavy loads, and hold traction well on both established and cross-country terrain—even on snow. However, on technical rock they can become clunky and insensitive. 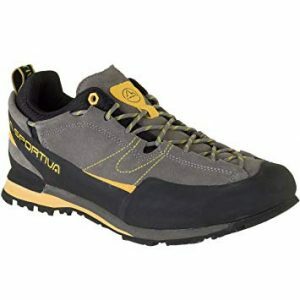 On the other hand, approach shoes that excel at climbing over hiking are a bit lighter and more stiff. The toe boxes are designed to handle edges and connection with rock. These shoes usually proved more sensitivity and precision. When buying an approach shoe, make sure you consider your intended use. For example, if you’re hiking long distances over snow and rock, you will want a different shoe than if you commute five minutes to the crag and need to be able to slip your shoes on and off all day. Approach trails have a reputation for being rather steep, unmaintained, and technical. Terrain could be wet, rocky, or dry. You will need to maneuver well all while still carrying your pack. For longer approaches, go with a highly durable shoe that is built for support and protection over the long haul. Some climbers heavily rely on their approach shoes to climb well. For this, you will want to look for a shoe that provides enough support and protection on the trail while being snug enough to climb well. A lower profile will also help when navigating steep rock. If you will be spending time in an alpine environment, you’ll want to consider how well your approach shoe handles snow. You’ll also want to factor in how your shoe handles crampons. Consider a higher-profile, sturdy design that can kick steps effortlessly. The three main areas of an approach shoe sole are: the toe box, the midfoot, and the heel brake area. Most approach shoes have a large rubber rand that surrounds the front, sides, and top of the toes. Approach shoes that are meant to edge and smear well will have a smooth patch on the sole underneath the toe. The outsole design can vary quite a bit between brands and models. Dotty styles provide great surface area on rock, but don’t perform as well on wet or snowy terrain. However, models with sharp tread on the midfoot are made to provide high traction on wet or snowy terrain. Shoes that do well on wet terrain tend to be a little more clunky on technical rock. The heel brake is made of strips of sticky rubber for traction and downhill braking. Not all shoes include a heel brake, so be sure to look for this if you are in need of one. 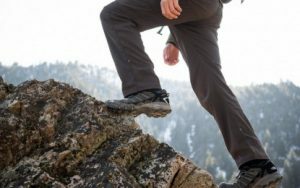 If you primarily wear your approach shoes for hiking and moderate scrambling, edging will not be a huge factor for you. However, if you want to climb technical terrain in the same shoes you hike in, you will need a stable edging platform. Look for a flat rubber patch under the big toe that provides a smooth and responsive platform. Also, you’ll want to consider models where the rubber rand comes flush to the sole. This provides a seamless, stiff edge similar to a climbing shoe. Most climbers limit their excursions to day where conditions are dry and warm. As far as approach shoes go, breathability is a far more important factor than waterproofing. However, it is nice to have some water-resistant capabilities if your climb takes you into the mountains. The added benefit of water-resistant shoes is the extra protection against creek crossings, surprise rainfall, or snow. However, the extra liner will add weight and impact breathability. Approach shoes designed with a mesh upper are going to breath better than sued or leather. Canvas shoes fall in the middle of the breathability spectrum. Keep in mind that the more breathable the shoe, the less durable or protective. A combination of a mesh upper surrounded by a protective rubber rand is a good middle ground. However, mesh uppers are more permeable to small debris such as sand, dirt, and snow. The weight is an important factor both on your foot and in your pack or harness. After miles of hiking, every pound counts. Definitely consider the length you will be moving as well as the weight of your approach shoes. If you will be carrying you shoes more than hiking with them, you’ll definitely want to opt for lighter weight. However, the lighter the shoe is, the less protection, durability, and stability it offers. Most approach shoes have built-in internal supports that offer a degree of stiffness. They are in between a light trail shoe and a stiff mountaineering boot. The more technical your terrain, the more stiffness you’ll require from your approach shoes. Shoes that offer a rand that extends over the toe box provide extra protection from stubbed toes and add traction on rock. Some shoes even offer a full, wrap-around rand that provides this protection around the entire foot. The larger the rand—both in height and in area covered around the foot—the more durable the shoe and the better it will perform in cracks and on rocky trails. However, more rand also contributes to more weight and less breathability. The upper is the fabric that connects to the rubber outsole. It directly correlates with durability, water-resistances, and breathability. Many shoes are designed with either synthetic mesh, leather, or a mix. Mesh offers the most breathability and cuts weight. However, it detracts from waterproofing, durability, protection, and climbing performance. The leather on approach shoes will be less clunky than that of a hiking boot. Leather provides the most protection, durability, and water-resistance. However, it is the least breathable. There are many different choices when looking into approach shoes. First, consider your needs and how you will be using your shoes. Knowing your terrain and the amount of time you will spend in certain conditions will drastically help you decide which shoe is best for you. If you on going on long hauls over a variety of terrains, you’ll want to look for the most versatile shoe option. That way you can remain comfortable without having to bring extra gear to change into. This will help you keep your pack light without impacting performance. If your approach is short but rocky and steep, you’ll want to opt for a shoe that climbs really well. Comfortability and performance are the most important factors to consider when looking at approaching shoes. You don’t want to tire yourself out before the big climb has even begun.